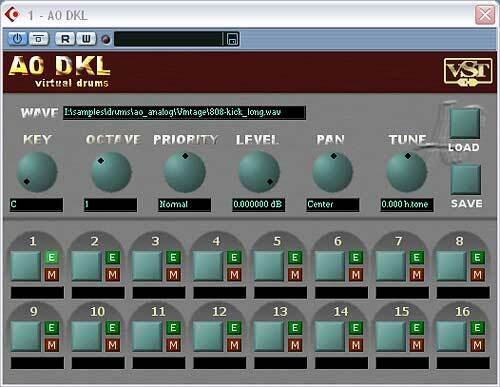 Linplug RM-F - manual - superb freeware VSTi drum/sample player from Linplug... the RM-F - a must have s/w !! New price: free !! | S/H price: free!! 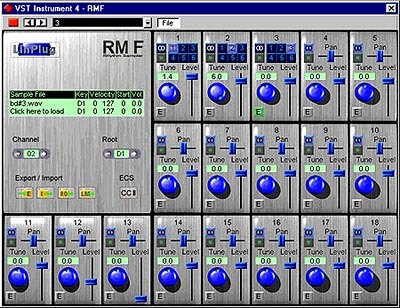 "The ultimate freeware rhythm module for PC whether you are in dance music or any other style. 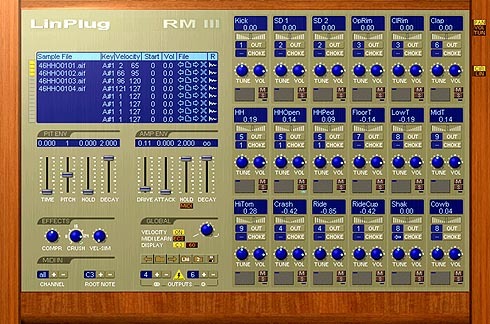 Play your samples and enjoy the unique RM-Series quality"
And for once it's TRUE.. this really is a superb s/w you'd be well happy with even if you had to pay for it.. BUT IT'S FREE !!! 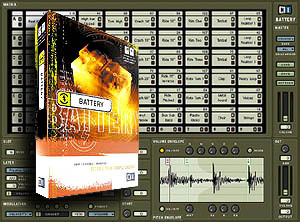 Ok.. so 24 bit/96k quality, 18 samples x 2 per RM-F 'kit' with 24 voices at anytime!!... 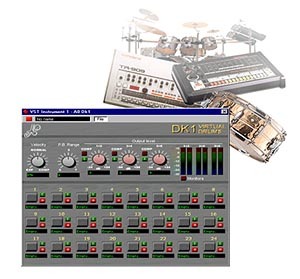 it loads LM-4 drumkits (max 2 samples/layers per drum-slot) and is NOT crippled in anyway... you can either load any LM-4 kits you might have, or it'll load and save it's own kits made up of .WAV or AIFF samples !! 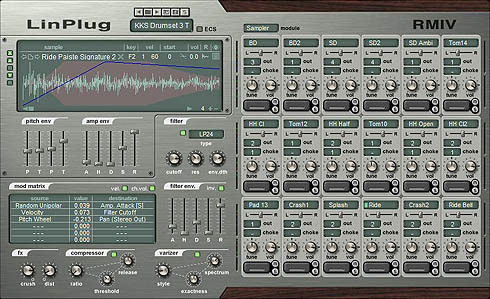 - samples 'slots' can be allocated to unique midi channels too !.. 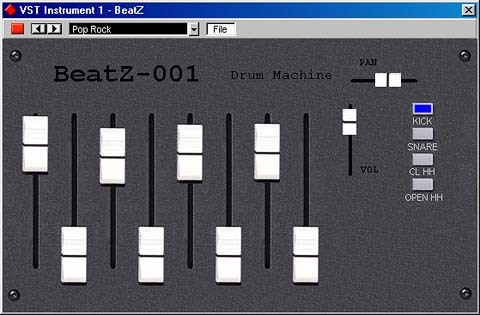 so you can have drums going from the same 'kit' on different channels. More - more - and yes... more!!! 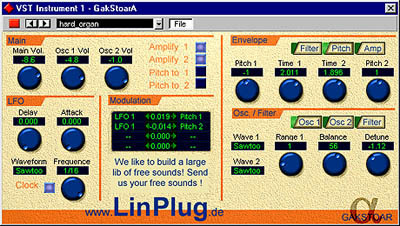 Output With this button you route the instrument to the stereo output or to one of the six individual outs. When the button is lit the signal is sent to stereo out and you'll find a Pan slider next to it. If it is depressed another six buttons will appear right of it allowing you to select the desired individual output. Name You can give your instrument a descriptive name here. This makes it easier to keep track of your kit. Pan When the stereo output is assigned you can adjust the pan position with this fader. On stereo samples, the pan slider balances the left and right channel. On mono samples it positions the mono signal in the stereo panorama. Holding down the Ctrl-key of your keyboard while clicking on it will center exact to the middle of the stereo panorama. 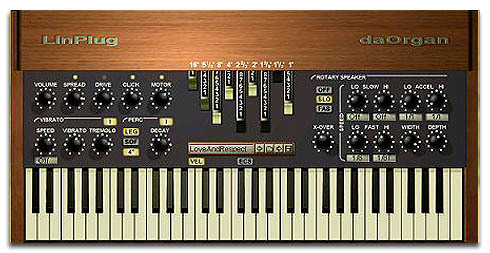 Level Adjusts the instrument Volume. If the instrument consists of two samples, both samples are affected. Edit This button selects the instrument for editing. It is lit to indicate that additional instrument data is displayed on the top left area of RM F.
"Sample processing is a key feature of the RM series! 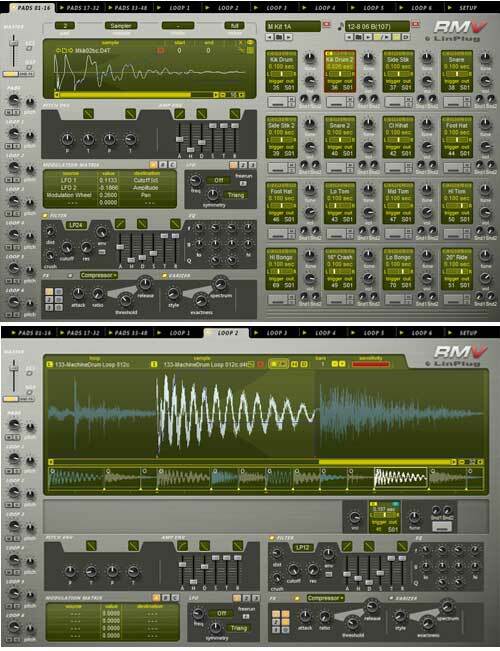 And the RM F features exact the same processing than the RM 2. Great care has been taken to keep the samples free from any artefacts or distortion. Every sample loaded will be analysed and processed in various ways to ensure maximum quality.You won't believe the quality of RM F's sound processing before you've heard it." 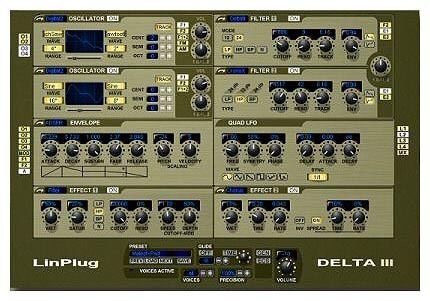 Having trouble with logic and this app. Logic won't recognize it as an instrument. Any help appreciated. I've started a thread in the emagic section if you've any advice. I'd like to check this app out! It seems alright, except that there's no decay. I have another free drum thingy with decay.. can't remember the name. i thought you get to download it? but please tell me how to download!!! For those still looking for RMF, you can download a version at SoftCentral.rr.nu at the download section, have fun with it :). no need for that, just go to the site link & click DOWNLOADS - it's that simple!! just go to the site link & click DOWNLOADS - it's that simple!! No it's not - can't see the word "downloads" anywhere. site link? - you mean the flip menu up top that says SITE? No downloads there. Sorry, I'll go to softcentral. OK after 10 minutes just seen it - you mean "Related Links" on the right with the illegible link to linplug where you can find the word Download. Sorry to criticise your site but sometimes the choice of colours is frustratingly illegible. I don't have all day you know. Their link didn't work either. see that title: 'RELATED LINKS' on the right of the page?, click it to go to linnplug.com. then, see that bloody great icon saying 'DOWNLOAD' ???.. Those were not the instructions given. 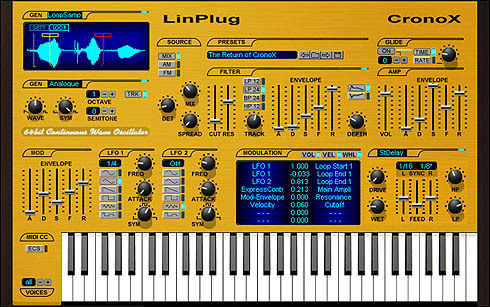 >click it to go to linnplug.com. >then, see that bloody great icon saying 'DOWNLOAD' ???.. This leads to a list of products includibg RM-F, click on that and get a page with 'The free download is available here.' Click on 'here' and you go back to page 2 - round and round we go. ahhh no?!! - too difficult for you is it? cant find the download ? to complicated for you is it?, ahhh what a shame. best bet then is to have a tantrum. >cant find the download ? No offense, but my point about the graphic design is a valid one, I'd say - too small to be readable, defeats the whole purpose of this page. At least three people here had difficulty finding it. Good site though, of course, appreciate the effort. Well, here comes the sarcasm again. well, if finding the d/l is too mentaly taxing, you aint got a hope of working the s/w, so why bother? hilarious guys! nice one I may just try this software now......where's that link again? Well, after all that, it's a great piece of kit, well worth the wind-up. I like underground music,I love vintage sounds and analogue drum machines.